A trend on YouTube that's been around a while for now are Let's Plays. Some are very good (Yogscast, Game Grumps, Two Best Friends Play, etc). Like AMVs, it's a common trend and done by most everybody. Other really cool video channels (gaming related) are the reviews and parodies of the Normal Boots gang (Jontron, Continue?, The Completionist, and Peanut Butter Gamer) and old Newgrounds brethren like Egoraptor. Before Youtube, I used to be a big part of Newgrounds my amvs and Sephiroth vs Mogs parody) and our AMVs were some of the first AMVs to populate the site since we were hosting them long before the site existed. Same tired story of mine, I know. Well, thanks to the awesome videos by those guys and with even friends of mine like, thelordxl and Greg Nugent doing similar videos...I think it was about time I came out of my original content retirement and join the game video bandwagon. In addition to teaching myself game design for both iOS (for Tenshi-Oni) and XNA (for a possible NYC game dev job).... I've also been hard at work, teaching myself Adobe After Effects and Premier Pro, reteaching myself Abobe Flash...plus learning the ins and outs of my new toy... the Elgato Game Capture HD. Without further delay...here's my first "QuickPlay". 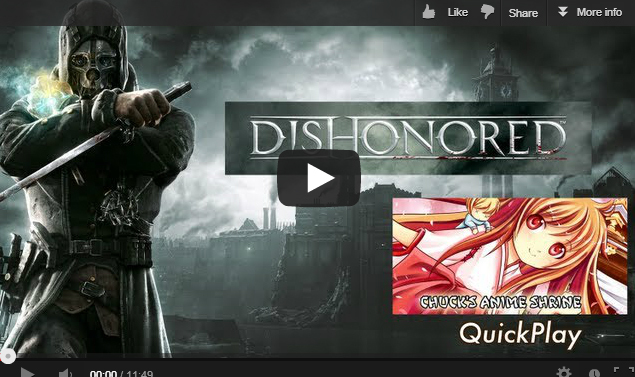 Do mind though... Dishonored is a bloody, violent game, so viewer discretion is advised.